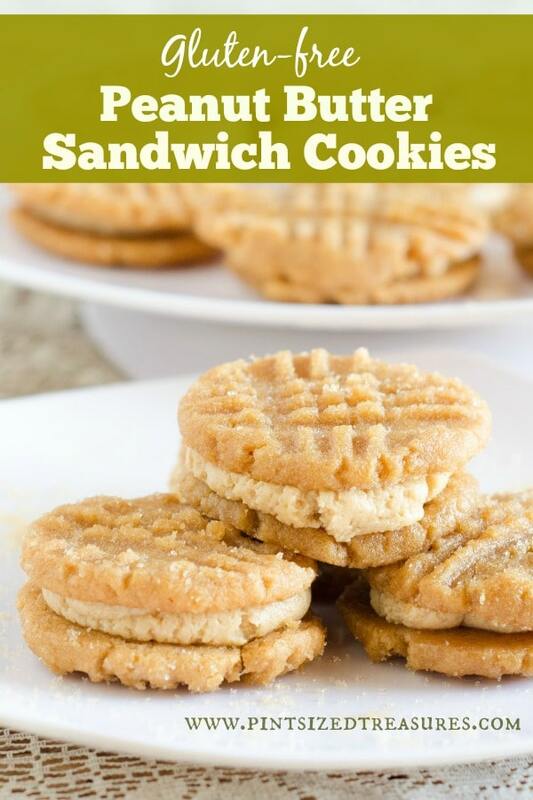 Peanut butter cookies are a classic favorite for most of us. However, sometimes I bite into a peanut butter cookie and wonder, “Where’s the peanut butter?” Have no fear! 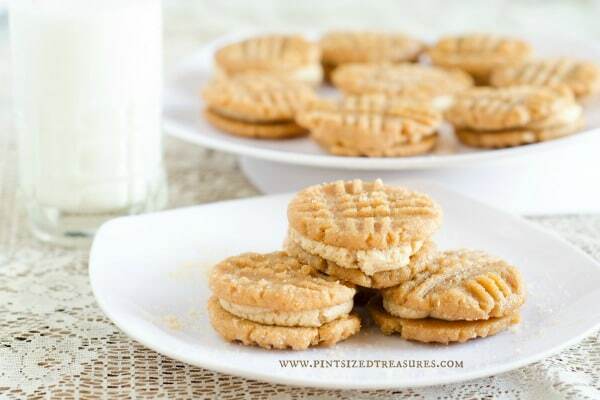 This recipe is overflowing with creamy peanut butter flavor and will soon become your go-to recipe for peanut butter cookies. Of course I want my kids to enjoy this classic cookie recipe, but one kiddo has to stay on a strict gluten-free diet. These cookies have ZERO flour and fit perfectly into her diet. I love that my daughter can enjoy a plate of cookies with her siblings. Most of the time she has to enjoy a different snack or dessert and can’t even touch the cookie plate. So, you can be sure this is a stand-by recipe for our family when those cookie cravings come knocking! I wanted to dress up these classic peanut butter cookies with some frosting. It didn’t look too appetizing lathering some frosting on top, so we decided to make cookie sandwiches! So glad we tried a plan B because it was MUCH better than plan A. The frosting is a cinch to make and adds a bit of fun to this much-loved classic cookie. I know your grandmother probably made a recipe with flour, baking soda and so on in it, but just try this one. Please. Pretty please? It you’re a peanut butter lover I can almost guarantee there will be no turning back to the floury stuff after you sink your teeth into these goodies. These are also fun to make with the kids. What kid doesn’t love making the criss-cross pattern on top? I still remember doing the criss-cross pattern with a friend of my mom’s when she was baby-sitting me. It was one of my favorite kid-baking memories. Every kids need to do it at least once! Enjoy this gluten-free recipe that everyone can enjoy. No special gluten-free flours or xanthum gum needed. Only yummy, natural ingredients with a not-so-natural frosting. (But, you can also make your own.) Here ya go! Preheat oven to 400 degrees Fahrenheit. Line three cookie sheets with parchment paper. Beat sugars and peanut butter together in medium-sized mixing bowl. Next beat in eggs until thoroughly combined. Now, roll cookie batter into one inch balls and place on parchment lined cookie sheets. Then, dip a fork in sugar and create a criss-cross pattern on each cookie. Be sure to dip your fork into the sugar before pressing each time. Bake for 6-8 minutes. Cookies will harden as they cool. Do not bake longer than 10 minutes! Remove from oven and cool. Now, prepare frosting by hand-mixing the peanut butter into the store-bought frosting. Once cookies have cooled, gently place one tablespoon of frosting on the flat side of a cookie and add another cookie to create a sandwich. Gently push down so both cookies are secured. Serve immediately or refrigerate until ready to serve. Yields: 20 cookie sandwiches.